An Assault Breaching Vehicle pushes a mound of dirt to repair part of Route Conan in Sangin, July 30. 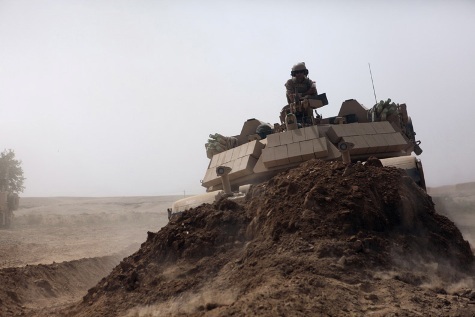 The ABV is a tracked, armored engineer vehicle with the same chassis as an M1A1 Abrams main battle tank, designed for conducting in-stride breaching of minefields and complex obstacles. The Marines of 3rd Combat Engineer Battalion, who are attached to Company K, 3rd Bn., 7th Marine Regiment, use the ABV to help repair the road when needed.